Although the Zika virus was first detected in Uganda nearly 70 years ago (see WHO Timeline) it was never considered a serious problem in Africa because human infection was rare and the illness it produced was extremely mild. The virus maintained these attributes as it slowly spread from Africa into equatorial Asia (India, Indonesia, Malaysia, Pakistan) during the 1970s and 1980s. Sporadic human infections - but no outbreaks - were reported. It wasn't until the virus arrived in 2007 to the South Pacifc island of Yap that a large human outbreak of Zika was recorded. Over the next three years more than 70% of the island's population was estimated to have been infected, although no serious illness or deaths were reported. In 2012 researchers determined that a new `Asian strain' of Zika had emerged, similar to - but genetically distinct from - the African strain. It was this new Asian strain that sparked the first large outbreak on Yap Island, and a variant of that strain that would arrive in the Americas 7 years later in 2014. In 2013-2014 Zika began to show some teeth in the South Pacific, where for the first time we saw in Zika, Dengue & Unusual Rates Of Guillain Barre Syndrome In French Polynesia, outcomes that challenged the notion that Zika only produces mild illness. In 2014 Zika landed in Brazil, likely brought in by a viremic international traveler, and found nearly perfect conditions to proliferate and thrive; a competent vector (Aedes mosquitoes), a year-round climate suitable for mosquito transmission, and an immunologically naive population. Within a year, well over a million infections had occurred, and while most were mild, we began to see reports suggesting that maternal infection with Zika could cause serious congenital birth defects, and some small percentage of those infected might be affected by Guillain-Barré Syndrome. In its multi-decade trek across Asia and the Pacific, the Zika virus changed, and was no longer the same innocuous strain that has caused so little trouble over the years in Africa. Which means that Africa - which shares the same sort of mosquito vectors and climate as much of South and Central America - could conceivably see a more robust, more `worldly' Zika virus find its way back to where it began. The World Health Organization, recognizing the potential, has released the following 18 page risk assessment analysis of Africa's vulnerability to, and ability to cope with, a return of Zika. Map the epidemiological likelihood of Zika virus transmission using information on the current and past reports of clinical cases, serological evidence of exposure in humans, evidence of the transmission by Ae aegypti of other arboviruses, specifically dengue, yellow fever and chikungunya and the information on the general presence of the Aeaegypti or other Zika transmitting. Develop a Zika virus risk assessment framework that includes indicators of main hazards, exposures, vulnerabilities and lack of coping capacities by country. 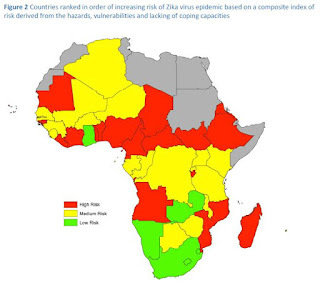 Implement a Zika virus risk ranking by country in the WHO African Region.